Keyless car theft is quickly becoming an epidemic in the UK. While car theft across the board has declined over the past couple of decades, the theft of luxury vehicles using a smart key, such as the BMW X3 and the BMW M6, is on the increase. Surely cars with keyless car entry and ignition systems are more secure? Keyless systems, while perhaps being more convenient for the owner, are also proving more convenient for the tech-savvy car criminal. The ADAC, a German automotive body, have recently warned owners of cars with keyless entry and ignition systems that their vehicles are vulnerable. They tested various models from 19 manufactures, from Vauxhall and VW to Lexus and BMW, and found that all of the 24 models tested were able to be easily hacked by using an inexpensive electronic device. One of the vehicles tested was the BMW 710d. And as with all the other cars with keyless systems, they were able to illegally open the doors of the vehicle and were able to illegally start the engine — within seconds. The findings of the ADAC concluded that if your car has a keyless entry and ignition system, it’s probably surprisingly easy to steal. So how are they being stolen? One of the ways the modern-day car thief carries out his trade is by amplifying and intercepting the signal from your car’s key fob with a simple electronic device. The radio connection between your key fob and your car can be compromised, even if your key fob is in your house. After gaining access to the vehicle, the thief plugs a programmer into the on-board diagnostics port and reverse engineers and reprograms the car’s security system, leaving the crook in complete control. Your car could be hacked and cruising down the road before you’ve finished your cornflakes. With both the BMW X5 and the BMW 5 series firmly in the top 10 of the most stolen cars, it might be time to think about how you can protect your vehicle from these cyber-savvy criminals. So how can I protect my BMW from keyless car theft? 24 hour control centre monitoring offers you around the clock protection. My Phantom App, which allows you to check the location, millage and battery voltage, all from the palm of your hand. OBD protection, with iTrack2OBD you will have added obd protection, meaning that a thief will be unable to steal your vehicle via its on-board diagnostics port. The sharp rise in keyless car theft is causing many insurers to insist that a tracking device is fitted prior to a keyless entry vehicle being insured. 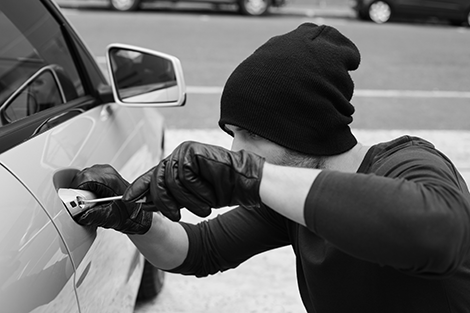 Don’t let car thieves take your BMW for aride; it’s time to protect your asset. Sophisticated and organised car thiefs could have their eyes on your BMW M5. According to the Metropolitan Police, keyless car theft was responsible for over 4,000 BMW and Range Rover owners being without their beloved vehicles in 2014 alone.